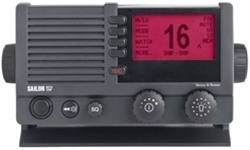 Latest generation of SAILOR VHF, fully waterproof with Simplex operation and revolutionary features. Designed for easy of use, includes a play-back function, loudhailer function and channel tri-watch scanning. Rugged, sturdy design, with large tactile buttons and bright display for easy operation.